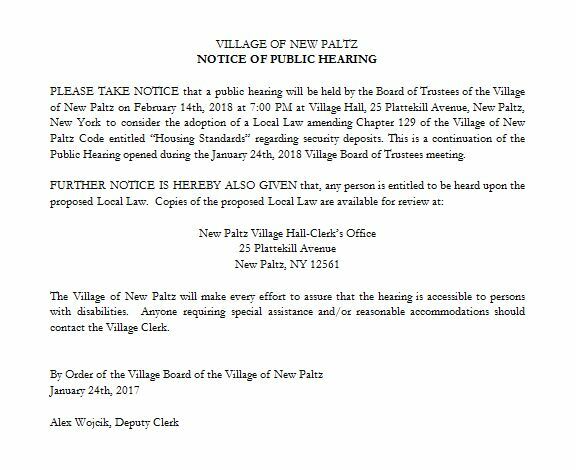 Please take notice: a public hearing will be held on 2/14/2018 by the Board of Trustees of the Village of New Paltz at 7:00PM at Village Hall to consider the adoption of a Local Law amending Chapter 129 of the Village of New Paltz Code entitled “Housing Standards” regarding security deposits. This is a continuation of the Public Hearing opened during the January 24th, 2018 Village Board of Trustees Meeting. You can read the proposed law online HERE.